Over the last couple months, this series has introduced you to a number of partner training ideas including partner tubing exercises, partner medicine ball exercises, partner boxing drills and more. Before I introduce you to a few more ideas, here’s some tips on how to be a good workout buddy. You definitely don’t want to be the training partner that never shows up! Decide on the day(s) and time(s) both of you will commit to training together. You don’t want to have to decide when the next training workout will be at each workout – make it simple and easy so you both know the exact day(s) and time(s) each week. It’s not that you can’t be flexible and adjust if needed but you don’t want to have to spend a lot of time reviewing each other’s schedule each week to determine when you can find the time. 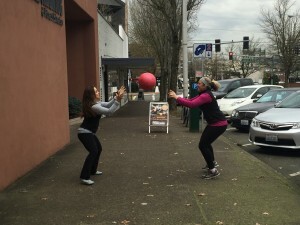 Partner Training – Week 7 Medicine Ball Training with Your Partner for Active, Quality Time! Working out with a partner is fun, challenging and because your buddy is counting on you, it’s great for helping you both stick to your workout routine. Here are a few more exercises you can add to your Partner Training program. Review past blogs for technique tips and training suggestions. Stand facing your partner. 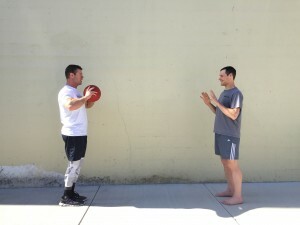 Shuffle for about 10 feet going one way while simultaneously tossing the medicine ball back and forth to your partner. Repeat going the opposite direction. Continue for 60-120 seconds. Last week, you learned a variety of partner training exercises you can do with a medicine ball. Today you can add to your repertoire. Remember when exercising with your partner, be sure to encourage them and avoid judging or criticizing. Make it a fun and enjoyable atmosphere and you’ll both be more likely to stick to the program. Start by standing tall with perfect posture facing your partner. 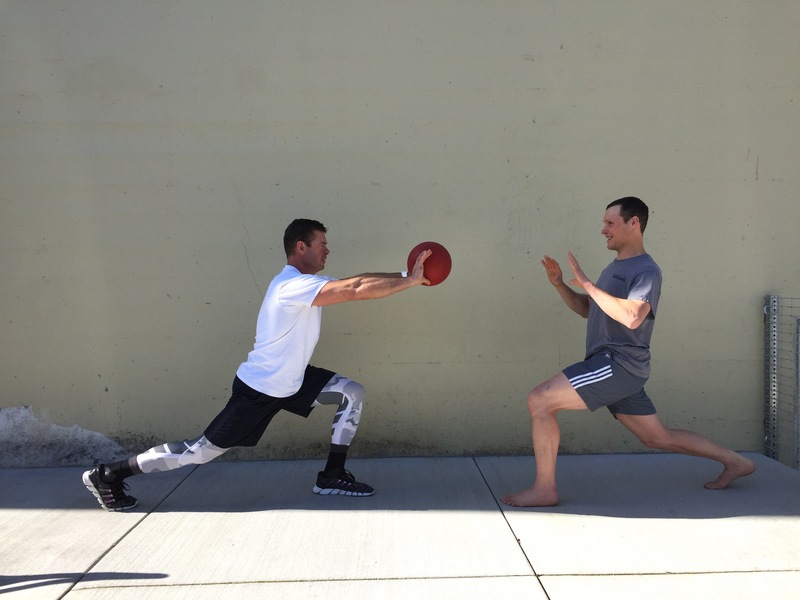 Lunge forward as you throw the medicine ball to your partner using a chest pass. Your partner will catch the ball while performing a backwards lunge. Repeat lunging forwards and backwards. Always remember to push off the front leg and be sure that while lunging your front knee stays over your front foot. Continue for 30-60 seconds each side. Partner Training – Week 5 Medicine Ball Training with your partner for active, quality time! Medicine Balls are a fabulous tool for working out with a partner. There are a ton of exercises you can do together to condition your entire body. They come in sizes from 2 pounds to much heavier. If you both have average strength, a 6 pound ball is a good starting point. To purchase you own medicine ball(s), visit your local sporting goods retailer. Each week over the next few weeks, I will provide you with three mini exercise circuits that you can do together. As you increase your fitness level, you can begin combining circuits for longer and more challenging workouts. 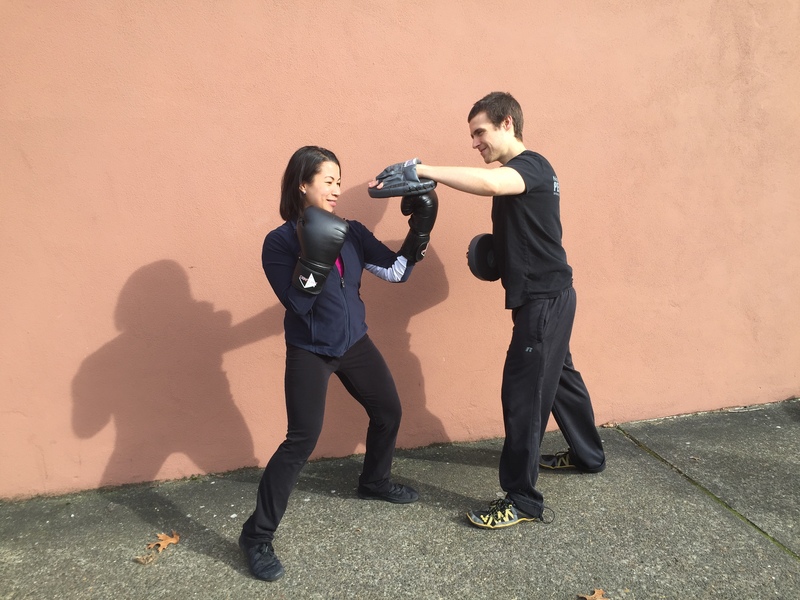 Partner Training – Week 4 Boxing Drills to do with your partner for active, quality time! Last week we learned some important technique tips for some basic punches that you can do with your partner for an active and fun workout together. Today we introduce you to some fun drills for combining some of those basic punches. When beginning any of the following drills, remember that you should have first practiced and mastered your technique for each individual punch. Then begin by practicing each particular drill in slow motion with no power so you can each learn where you need to be punching and where the pads need to held in order to safely and effectively execute the drill. As you each feel more comfortable, you can start adding a little more power and speed. 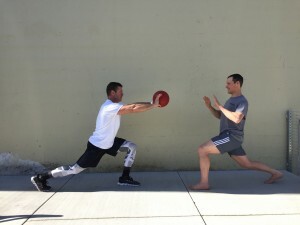 It would also be very helpful to invest in a private session with a trainer who specializes in boxing technique to ensure you are both punching and using the pads correctly. Partner Training – Week 3 – Box it out for quality time getting fit together! Boxing together as a couple is a great way to get an awesome workout and let off a little steam. So the next time you’re about to engage in a ‘heated discussion’, instead, try throwing on the gloves. You’ll be laughing and having fun and will soon forget what the issue was in the first place!